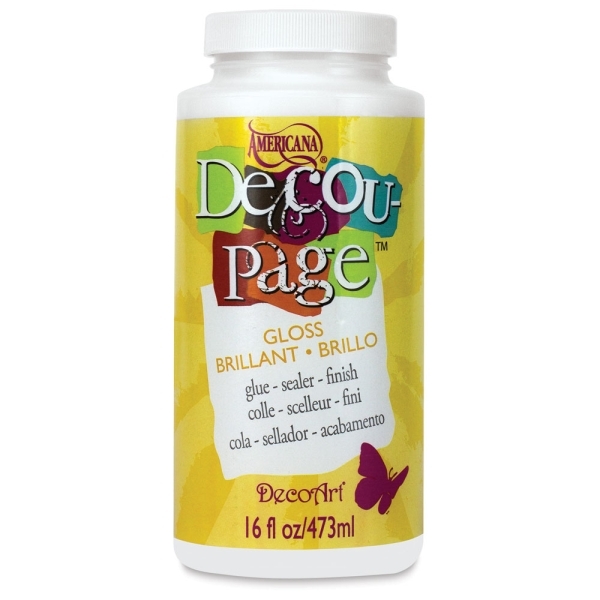 Americana Decou-Page is three products in one — glue, sealer, and finish. A staple for mixed media artwork, scrapbooks, and crafts, it bonds paper and photographs to cardboard, papier mâché, wood, terra cotta, canvas, glass, plaster, foam, fabric, and many other materials. It has a low-odor formula and dries quickly to a clear, hard, durable finish in your choice of Gloss or Matte. ® Americana is a registered trademark.